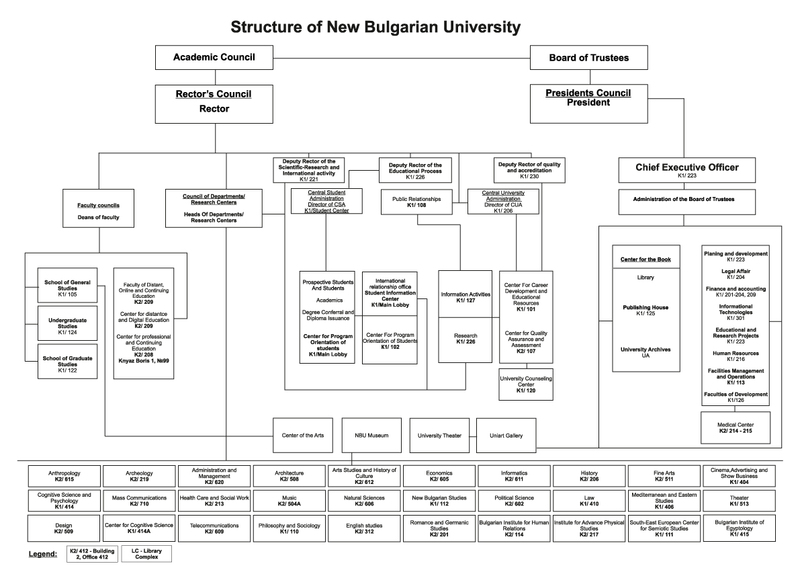 The Administration of the Board of Trustees supports the activities of the Chairman of the Board of Trustees and the Board of Trustees, which determines the development of the New Bulgarian University. The Administration of the Board of Trustees is managed by the Executive Director of the University and is directly subordinated to the Chairman of the Board of Trustees. Among the major projects of the Administration of the Board of Trustees are: the maintenance of the material environment at the University according to the modern European standards; the strategic planning system and the preparation of the NBU Annual Report, ensuring the transparency of the university activities; the system for analyzing the effectiveness of university structures; the financial system and the Central Strategic Development Fund. Important projects are the website of Prof. Bogdan Bogdanov (www.bogdanbogdanov.net); the preservation and popularization of significant donations and archival materials, including those of Prof. Vasil Stoilov, Prof. Petar Mutafchiev, Prof. Ivan Sarailiev; the development of the Integrated Information System, which provides quick access to information for prospective students, students, alumni, lecturers, administration. His work at the NBU began in 1991 as Assistant to the Executive Director with responsibility for budgeting, financial reporting, development of the curriculum, marketing and PR activities. From 1992 to 1994 he was the director of the Free Faculty. From 1994 to 2000 he was the director of the Central University Administration. Since 2000 he has been Executive Director of New Bulgarian University. His research activities cover topics related to university management - dissertation on "Modern forms of organization and management of the university institution. Transition to Entrepreneurial University ", research at the Faculty of Political Science at the University of Bologna under Professor Gilliberto Capano, specialization at the University for Foreigners in Siena, work on the project" Management of the Modern University. Social Aspects "at Surrey University and the Royempton Institute, London, Guilford and Oxford University. Among his NBU development projects are the Integrated Information System; The strategic development system; Quality management system; Procedures for assessment and appraisal of teachers, academic administration and administrative staff, university campus building, University Theater and UniArt Gallery, Raina Kabaivanska International Master Class and others. He is a member of the Board of Trustees, Presidential council of the Board of Trustees and on the Board of Trustees of the Raina Kabaivanska Fund and is Chairman of the Board of Directors of the Foundation for New Bulgarian University. coordination of the evaluation and attestation processes. coordination of the development plans and the plans of action, of the university structures with the policies of the Board of Trustees. work on external projects for the Board of Trustees and fund raising: Associated structures and funds to the Trusteeship. legal advice and representation of NBU. Coordination of activities under the “Lifelong Learning Program”: sectoral programs “Erasmus”, “Leonardo da Vinci”, “Grundtvig”, etc. planning and development of technical equipment, software and equipment for audiences, specialized training rooms and UPI. providing transport for the needs of the administrative structures of the University. acceptance of payments in favor of NBU. preparation of NBU's monthly and annual financial reports. • Learning activities – provides a stage and contributes to practical training in courses and out-of-school curricula in the programs of the “Theater” and “Music Departments”. • Creative work – produces student performances on the stage provided by the university or a host one at a different location also they hosts guest performances from other universities/countries. • Accompanying activity – together with the departments "Theater" and "Music" organizes creative events on the territory of the University Theater.